About half of a £2bn cash boost from the 2014 Autumn Statement for frontline health services in England was spent outside the NHS, research has found. The Health Foundation analysis for the Financial Times showed £901m was spent on buying services from private and non-NHS providers in 2015/16. It said £800m was spent buying the same kind of care from NHS trusts. Ex-chancellor George Osborne said in his final Autumn Statement before the 2015 general election that the money for NHS England was a "down payment" on a plan drawn up by NHS bosses, which called for an extra £8bn a year above inflation by 2020. The Health Foundation report also found that £1 in every £8 of local commissioner's budgets in England is spent on care provided by non-NHS organisations. Anita Charlesworth, director of research and economics at the Health Foundation, said: "Rising demand for emergency care meant that NHS providers haven't had the capacity to deliver planned care and patients had to be diverted outside the NHS. "NHS hospitals were left squeezed by sharply rising drug and staff costs with little additional funding. "The result was big deficits that had to be covered by raids on investment budgets." 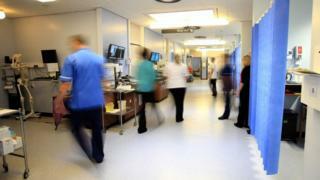 She said the NHS had to "urgently" consider how to ensure additional funds reach NHS providers. "The health service needs to plan better for emergency demand, fund emergency care fairly and make sure it gets the best possible price for care provided outside the NHS," she said. The Department of Health said it spends less than 10% of its budget on independent providers. A spokesman said: "This report simply shows the NHS is making clinical judgments about delivering high-quality care for patients. "The truth is that for many years the independent sector has made a contribution to helping the NHS meet demand, now amounting to less than eight pence in every pound the NHS spends."